SEATTLE (CNS) — When the Seattle Seahawks step onto CenturyLink Field, the fervor of the “12th Man” may cause small earthquakes. But for 12 years, Father Tom Belleque made sure the team’s Catholic members also had the force of their faith with them on the field. That’s because Father Belleque celebrated Mass for Catholic Seahawks players and coaches the night before every home game. “When I first went in I thought, ‘Oh, I can work that into my schedule, a Mass,'” he recalled of juggling being pastor of St. Louise Parish in Bellevue, Washington, with the Seahawks commitment. He found that the role had an impact far beyond that. Father Belleque’s celebration of Mass for the team ended in July when he became pastor of St. John the Evangelist Parish in Vancouver, Washington. He since has handed over his Seahawks role to two priests who live closer to Seattle. But he keeps in touch with the players and coaches with whom he prayed, counseled and befriended. And he will be rooting for the Seahawks as the team enters the playoffs in January. Among the Catholic Seahawks at the Masses were tight end Luke Willson, general manager John Schneider, defensive coordinator Dan Quinn, assistant strength and conditioning coach Jamie Yanchar and tight ends coach Pat McPherson. The priest, who was ordained for the Seattle Archdiocese in 1985, described the group as “a spiritually mature group of men” who “love their faith and deeply appreciate the fact that there’s priests who come” to say Mass for the team. On home game weekends, the team gathers at their hotel for a pep talk, dinner and, for those who choose, the chance to go to Mass or a Protestant service. In a hotel meeting room, the small group of Catholics gather chairs around a table used as an altar for a simple Mass. Team members who attend say it makes a big impact. “The relaxing factor for us to get in there and spend some time to unwind and think about something else outside of football is a huge thing,” Yanchar said. 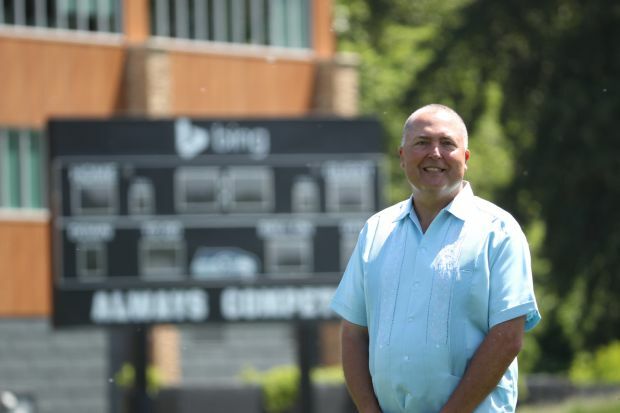 Father Belleque’s services to the team included helping Seahawks with baptism preparation for their children, godparent preparation and counseling. He took prayer requests, presided at McPherson’s parents’ renewal of marriage vows, and recommended parishes to team members new in town. Father Belleque also often got calls from visiting teams looking to have Mass while they were in Seattle, and he would find a priest. Willson also said that Mass time on game weekends was a way to calm his nerves and gave him perspective on his larger life, faith and family. “(Mass) was something I felt really affected my mentality of how I approached games and really helped me play a lot better as well,” he said. Although Father Belleque is no longer as close to the team, he left on a high note: getting to see the Seahawks win the Super Bowl last February. On Super Bowl Sunday, Father Belleque said an extra prayer to Our Lady of Victory at all of his Masses and continued the practice on game days this season. When the Seahawks won, he thought about how excited his late father, an original season ticket holder, would have been. As for himself, Father Belleque was euphoric with the NFL championship. The priest, who grew up playing baseball, basketball and golf and throwing the discus, and had rooted for the Seahawks since their first season in 1976, now got to text a Super Bowl congrats to the Catholic team members he had spiritually supported. Weaver is multimedia editor for Northwest Catholic, magazine of the Seattle Archdiocese, and the website NWCatholic.org.